Get the hang of the best practices of Mac malware removal to get rid of weknow.ac browser hijacker and stop annoying traffic redirects in their tracks. The hypocrisy of the present-day online world is that there are tons of claims that are either outright false or misleading. One of the hot security subjects being discussed in the Mac community revolves around a web service referred to as weknow.ac. It is a URL that anyone is free to enter in their browser and visit without worries that something terrible will happen to their machine. This is the scarce benign part of the matter. The shady facet, though, has to do with a potentially unwanted application (PUA) that forces hits to the web page in question. In other words, lots of people go to weknow.ac recurrently and nearly all the time – just because they are redirected to it. And it’s a piece of malware to blame for this predicament. Weknow.ac bears a resemblance to chumsearch.com, another nasty hijacker that has been in the wild for more than a year now. This similarity is a clue that the two hail from the same place and were made by the same people. Given the immense amount of traffic intercepted by ChumSearch, it’s within the realms of possibility that its successor is going to wreak havoc in the Mac ecosystem as well. Back to the point, the malware behind weknow.ac doesn’t spread like any regular app does. There is no clear user consent accompanying its distribution, nor is it available to download and install on certified, official software portals for Mac. Instead, the culprit goes bundled with other programs, these compound setups being promoted on questionably legit app repositories or via social engineering. For instance, the starting point for the contamination can be a stealthy script on a compromised site that triggers a rerouting to a spoof Flash Player update page and says you badly need to install the latest version to continue. And voila – the pest is inside and gets started on its shenanigans. But again, the primary means of propagation is all about bundling, where users naively believe they are installing something remarkable, but the main program has got company, including WeKnow and other junk entities like the MyShopcoupon adware and MacCleaner fake optimization tool. The trespass will go all the way through unless the would-be victim deselects the undesired extras on the custom installation pane. As soon as the weknow.ac virus has crept its way into a Mac, it gets automatically added to the system’s login items and embeds an obtrusive add-on to web browsers. It is cross-browser, so Safari, Chrome and Firefox will suffer the impact to an equal extent. The rogue helper object will forcibly modify custom web navigation settings, such as the homepage, default search engine and new tab page. All of these values will start resolving weknow.ac website. Consequently, when opening the browser, trying to do a web search or spawn a fresh tab, the victim will see the wrong page pop up instead. Anything entered in the search box on there will be looked up via WebCrawler service, so the WeKnow provider doesn’t have any search functionality of its own. It simply dispatches the queries further while grabbing people’s traffic and monetizing it. This is the whole point of the average browser hijack, but few baddies from this category are as prevalent as the one under scrutiny. Anyway, if your Mac is acting up this way, the browsers being diverted to weknow.ac, don’t fail to follow the tips below and eradicate the troublemaking code for good. When confronted with malicious code like the weknow.ac on Mac, you can neutralize its toxic impact by leveraging a specially crafted system utility. The Freshmac application (read review) is a perfect match for this purpose as it delivers essential security features along with must-have modules for Mac optimization. This tool cleans unneeded applications and persistent malware in one click. It also protects your privacy by eliminating tracking cookies, frees up disk space, and manages startup apps to decrease boot time. On top of that, it boasts 24/7 tech support. The following steps will walk you through automatic removal of the weknow Mac infection. 4. 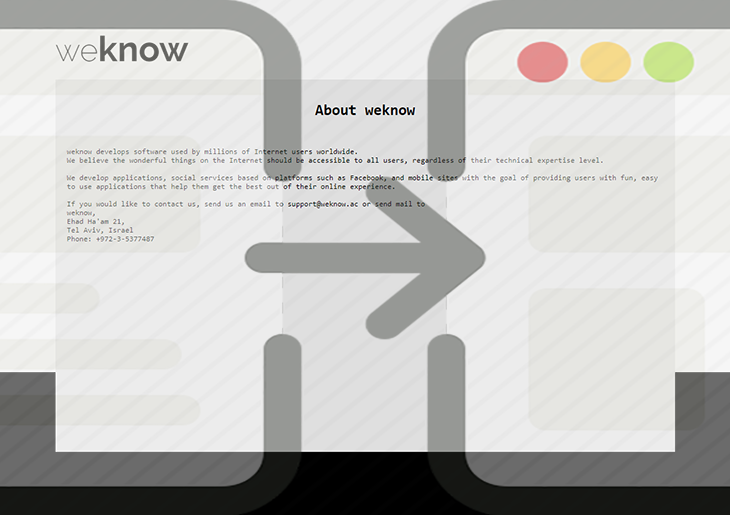 Check whether the weknow.ac redirect problem has been fixed. If it perseveres, go to the Uninstaller option on Freshmac GUI. Locate an entry that appears suspicious, select it and click Fix Safely button to force-uninstall the unwanted application. 5. Go to Temp and Startup Apps panes on the interface and have all redundant or suspicious items eliminated as well. The weknow.ac malware shouldn’t be causing any further trouble.